When Rafael Nadal raised his hands to the Monte Carlo sky in victory with fists clinched this Sunday, he had a smile on his face that reflected relief more than ecstasy. While waiting to be called on stage for the presentation, he looked at the giant screen flashing pictures of him holding the trophy each of the previous nine times that he had prevailed in this beautiful stadium by the Mediterranean Sea. Nadal shook his head in utter disbelief at how his life had panned out. And during his speech at the ceremony (after first congratulating and saying nice things about his opponent), Nadal spoke about his journey at this 110-year-old ATP Masters 1000 tournament which started as a qualifier in 2003. 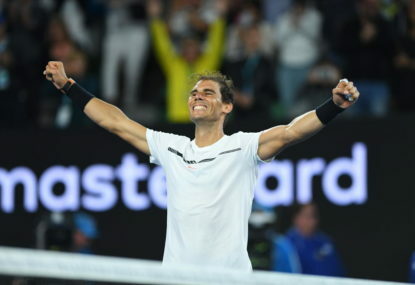 After a journey that included a 46-match winning streak between 2005 and 2013 and ten winners’ trophies, Nadal admitted he never even dreamt it could happen. “I can just say thanks to life for the opportunity,” was his humble closing remark. It is indeed difficult to comprehend the feat. By winning the Monte Carlo Masters on Sunday, Nadal became the first man in the Open Era to win ten titles at the same tournament. And just so we are under no illusion that this is a tournament the other top players do not bother to show up at, the Monte Carlo Masters 1000 is one of the oldest tennis tournaments in the world, and ranks just below the four Grand Slams. The only top-five player not playing this year was Roger Federer, who is clearly saving himself for Wimbledon. This elite list also has Nadal’s name in the next slot; he has nine titles each at the Barcelona Open and the French Open, both coming up in a few weeks’ time. So there is a possibility that by the time we get to the European summer, there will be three tournaments with Nadal’s name as a ten-time winner inscribed on the trophies. That would be a jaw dropping feat and difficult for anyone to match again. It is unlikely that the next man on that list, Roger Federer, with eight titles at Halle and seven titles each at Wimbledon, Dubai, Cincinnati and Swiss Indoors, will be able to play on long enough to achieve this milestone. At Monte Carlo, Nadal also became the only man in the Open era to win 50 titles on clay. From the King of Clay, he became the Emperor. Let’s pause here just for a moment to reflect. These 50 titles have been won playing 404 matches whereas when Guillermo Vilas won his 49th, he had already played more than 500 matches on clay, and went on to play 821 matches while his tally would remain at 49. Nadal has won 92 per cent of all matches he has played on clay in a career spanning 16 years on the circuit, and 82 per cent of all matches that he played. His closest rival in tennis, Federer, owns the hard court, with 61 titles, winning 82 per cent of all his hard-court matches played in his 19-year professional career. As Nadal approaches his 31st birthday this June, his fans will take heart from the fact that he is recovering well from the multiple injury breaks he has been forced to take over the past few years. All he needed was a scent of weakness from David Goffin in the semis and Albert Ramos-Vinolas in the finals to drive home the advantage. It will surely help matters that he enters the 2017 clay court season at a time when the top two players in the world are not at their peak and the next generation is struggling to make a mark. But whatever advantage he gains from that, will be because of Nadal’s own brilliance on the surface and hunger to keep winning. But no matter what he does, and no matter how he goes about it, Rafa’s opponents need not delude themselves about his hunger and his intent. As the media meet ended at Monte Carlo, Nadal was asked one last question about what ten titles at Roland Garros would mean to him. He answered in three words before walking off with a smile.